Duality is creating a solution for workflow and revolutionize the current methods used for the ‘digital signing’ of documentation, reducing the currently lengthy and costly process that is ‘digital signing’ to just a few simple steps. Presently ‘digital signatures’ (which improve upon electronic signatures) are the go-to solution when it comes to the burdensome task of adding verifiable signatures to documentation in a relatively fast and easy fashion. Although ‘digital signatures’ do offer an improvement over ‘electronic signatures’, they are time-consuming, require up-to-date certificate security standards and are expensive to maintain. Utilizing BDAP(Blockchain Directory Access Protocol) and the blockchains of Dynamic and Sequence, Duality Blockchain Solutions pSign uses an asynchronous workflow; allowing the ‘digital signing’ process to be verified within seconds and secured within a matter of minutes without holding up the user until it completes. In terms of workflow, pSign will be bundled with document templates, libraries and support full automation. Infrastructure expenditure for administrators, security specialists, postmasters, as well as costs associated with printers, scanners, faxes, tablets, software, forms, and secure data transfer, will be decreased exponentially or reduced entirely. 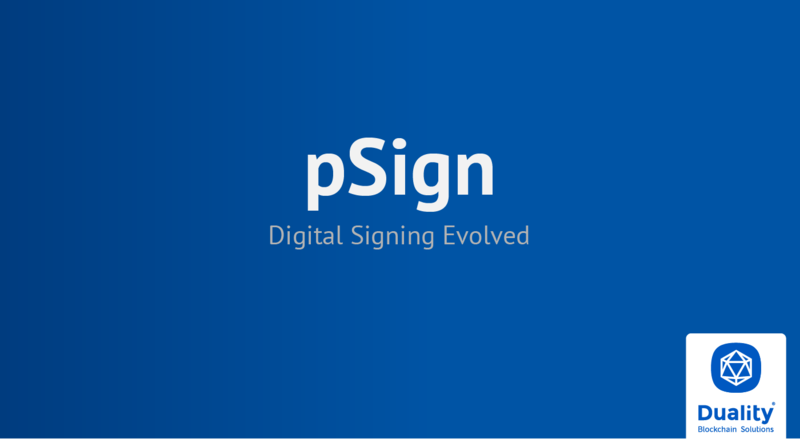 pSign will bring an evolution to digital signing security and workflow management, set to revolutionize industry standards for years to come. Duality provides solutions for secure data storage and verification to both companies and the public through the use of a hybrid public/private network.